Starting Cyber Monday, and for one week only, we're offering 50% off on digital "cyber manga"—manga that features some of our favorite all-star cybernetic heroes, including Inuyashiki, The Ghost in the Shell, Battle Angel Alita, and the latest big fantasy hit, That Time I Got Reincarnated as a Slime—at all our digital retail partners: BookWalker, comiXology, Google Play, iBooks, Kindle, Kobo, and nook. Sale runs through December 4. Wondering what cyber manga to get into? One series that you have to check out is Inuyashiki! The protagonist Ichiro Inuyashiki looks like a washed up old man, and he does start out as one … until we find out he he gets both a cyborg body and the heart of the true hero. One of the hottest anime this season, Inuyashiki: Last Hero is now available as simulcast on Amazon Anime Strike. 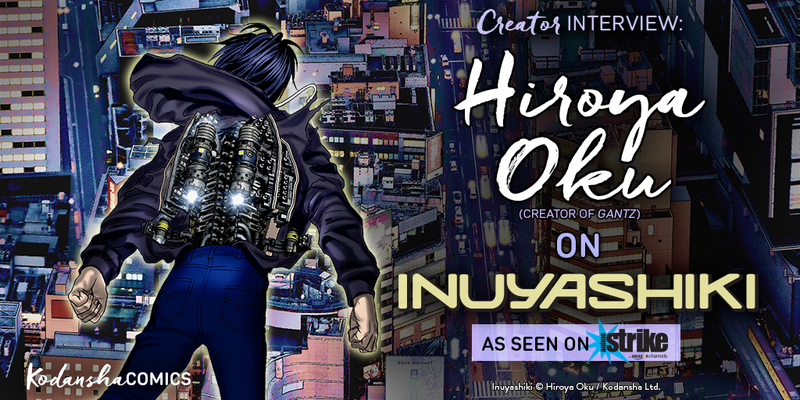 The original manga by Hiroya Oku (creator of GANTZ) reads like a major motion picture … Find out why in this brand-new interview with the creator and the editors of Inuyashiki, who go into the making of manga, anime, and forthcoming live-action movie!